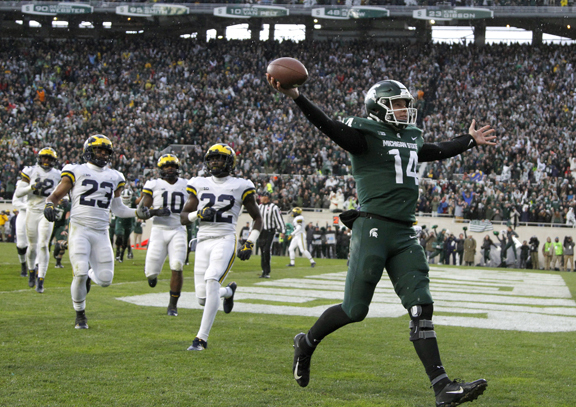 Redbox Bowl: Michigan State vs. Oregon, 3 p.m.; TV: Fox-U.P. SANTA CLARA, Calif. — Oregon coach Mario Cristobal got a big win in bowl season even before the Ducks took the field. Star quarterback Justin Herbert announced he’s returning for his senior year, immediately turning Oregon into a playoff contender. With all 11 starters expected back next season, the Ducks (8-4) will get a big head start on 2019 when they close this season this afternoon in the Redbox Bowl against Michigan State (7-5). Herbert should provide a tough challenge for the Spartans. The Ducks have a potent running game with talented freshmen CJ Verdell and Travis Dye, who are one of just six Power Five duos with at least 700 yards each. But they will be in for a tough test against a Spartans defense that is No. 1 in the nation against the run. Michigan State has allowed just 81.3 yards per game and only 29 runs of at least 10 yards all season. The time off before the bowl did a lot for Michigan State quarterback Brian Lewerke, who missed three games down the stretch with a shoulder injury. Coach Mark Dantonio has said Lewerke’s arm strength is back and he will start the bowl game.